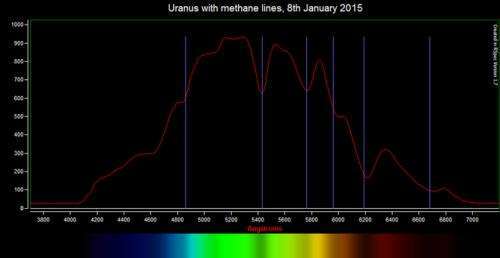 Most of the times we have looked at Uranus, it has seemed to be a relatively calm place. Well, yes its atmosphere is the coldest place in the solar system. But, when we picture the seventh planet in our solar system invariably the image of a calming blue hazy disc that the spacecraft Voyager 2 took in 1986 comes to mind. However, all we have previously known about the atmosphere of Uranus has been 'thrown to the wind' with observations made last year. In August 2014 a group led by Imke de Pater pointed the Keck telescope at Uranus and were a little bit surprised to see storms raging. It wasn't as though clouds haven't been seen before, but the clouds they spotted last year were very much brighter than any seen before. 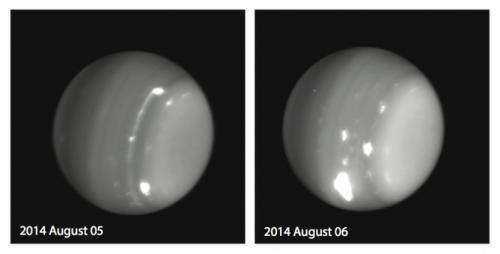 The fact that the storms are bright in the methane spectrum isn't a surprise – Uranus, and its neighbour Neptune, are pretty much just big balls of methane, water and ammonia (but it does make for a snigger-worthy headline). The storms are described in a paper recently published in Icarus, with the pre-print available here. After the first observations, the group put out a call to amateur astronomers to see if they could also observed this unusual activity too. They did, and with this information the group built a case to point the Hubble Space telescope at Uranus, which happened in October. Again, they saw large storms, showing that what they had seen in August hadn't been a one off event - the weather report on Uranus is looking rather unsettled. Uranus was the first planet to be discovered in the 'recent' era of science. All the planets up to Saturn were observed to be different 'wandering' stars by many ancient cultures – so we'll never know who first spotted them. 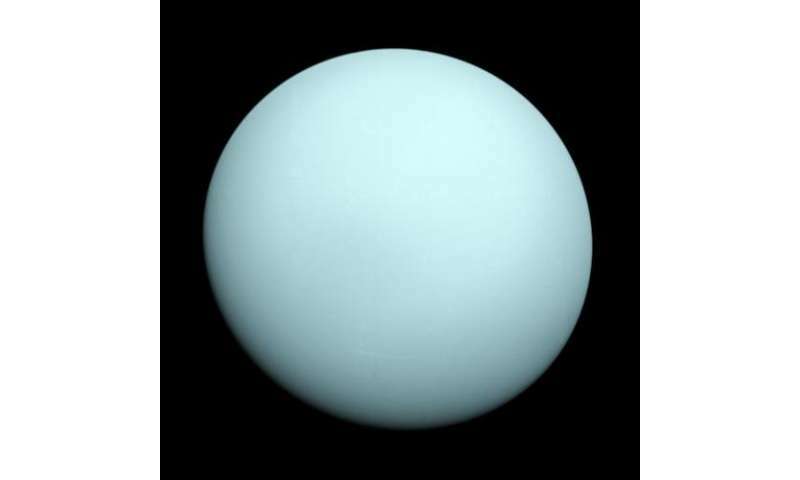 But Uranus was first observed in 1690 by John Flamsteed. He plotted it six times – but didn't realise it was different from any other star (he catalogued it to be 64 Tauri). The French astronomer Pierre Lemonnier also observed Uranus, but didn't distinguish it from the other stars he was watching. It was William Herschel who realised, in 1781 after thinking it was a comet, that he'd seen a planet orbiting further from the sun than Saturn. Despite knowing where it was for over 300 years, we've only in the last decade started to take a detailed view of the Northern hemisphere of Uranus. The observations made by de Pater and her team are the first time this giant region of our solar system has been surveyed by modern telescopes from Earth. This is because of the very strange rotation, which makes Uranus pretty unique. Our Earth rotates on its axis tilted only slightly from being straight up (if we define up as being perpendicular to a planet's orbital plane). It is this tilt that drives our seasons. Uranus has the most extreme tilt of axis in the whole solar system, it is inclined 98° from up. This means Uranus has the most extreme seasons – as each hemisphere of the planet faces the sun as it orbits (a cycle that take 84 years). The upshot is that as the Northern hemisphere has been in winter until recently, and from Earth we have been unable to see it. 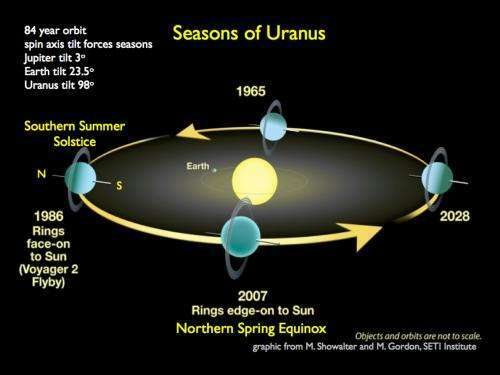 In 2007 Uranus reached it's equinox, with the equator pointing at the sun and each of the two hemispheres illuminated. The group observed Uranus with the Keck telescope as it past equinox seven years ago. They expected to see storm activity, as parts of the planet that haven't seen the sun in 20 years started to come to light. They thought it has gone quiet again, which is why 2014's storms took them by surprise. Added to this is the fact the storms are flaring up in the Northern hemisphere, the part of Uranus that is entering its spring, and thought not to have warmed up from its prolonged winter yet. Where is the energy to drive these storms coming from? That's the mystery. Storms on the other gas giants are thought to be fed by energy from their dynamic interiors. Voyager 2 saw that Uranus should have a dynamic interior (it has an active magnetic field like Neptune) but that little of this energy is reaching the atmosphere. This is why Uranus is the coldest planet in our solar system, parts of the atmosphere were observed to be a chilly -224°C. What this observation of these giant storms really does highlight, is just how little we know about our solar system's giant icy planets Uranus, and its neighbour Neptune. In the light of the fact that missions like Kepler are finding many other similar planets orbiting distant stars, we really need to sort this out. Hopefully knowing more about our 'local' planets will mean that we can understand much more about those further away. Meanwhile, while we in Australia may have past our summer – think of the Southern hemisphere of Uranus where a 20-year winter is coming…. Very interesting. In addition to looking at the planet with telescopes, they should send probes into Uranus to get a closer whiff at the situation. Where is the energy to drive these storms coming from? That's the mystery. It's only a mystery if you disregard the electrical effects the Sun has on it's planets. Think all you want, but better to just refer to it as "a thought" A theory in science is usually regarded as an already proven set of rules. It's not that a crazy thought either, I think on some forums and encyclopedia's you should be able to find conclusive answers about the properties of Uranus' make up and atmosphere and narrow it down from there. Is the headline written by comedian? Look up "metallic hydrogen", you may come up with a newer theory. Uranus has a magnetic field so probably has a molten core covered by rock like Earth does. Little impact, the data do not support, as opposed to the Neptune and Jupiter. The winds are moving in the direction of rotation, which could be the answer. Bonus: both papers are relatively straightforward/easy to follow and both have awesome images of the recent storms on the planet courtesy of Keck, Gemini and HST! Hmm... quite the mother lode of information on Uranus, and just from telescopes. So, imagine if they sent a probe up there. Are you sayin' - "It's probin' time..." for Uranus? Metallic hydrogen was first synthesized in 1996 at Lawrence Livermore National Laboratory on accident by putting over a million atmospheres on it and heating the hydrogen. It would be a serious problem if it didn't exist because it would break patterns in the periodic table, our understanding of electromagnetism, and it would remove any explanation of why Jupiter's magnetic field is so awesome. Not really news ... But it IS global warming. All of the planets have been experiencing this kind of "Climate Change" for several years, ever since the Sun stopped producing so many Sun spots. Jupiter, too, lost The Great Spot (storm) just a few years ago, now there are a bunch of small Jupiter spots/storms there.